The days of hiding away in your hotel room are over. Today, travel means truly getting under the skin of a destination, and taking in the local sights, sounds and smells to fully absorb the local culture. That’s even better if you head out armed with prior knowledge of the restaurants, shopping and attractions you want to see. 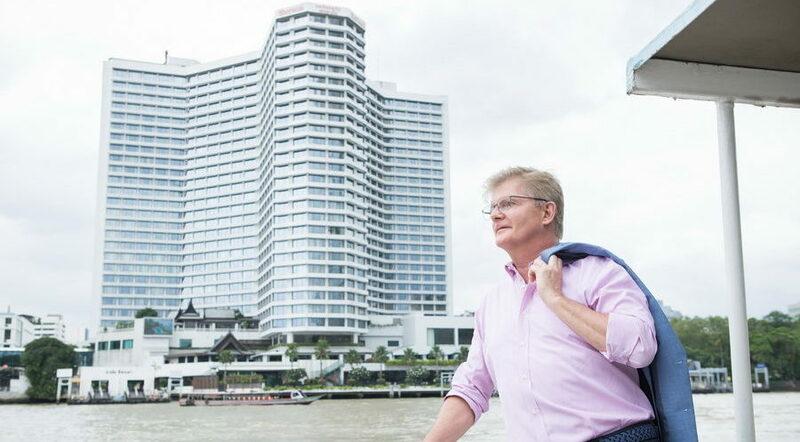 With that in mind, I sat down with Michael Schlueter, GM of Royal Orchid Sheraton Hotel & Towers, to get the low down on the hotel’s ‘one-hour gems’ programme and where exactly the best spots on Bangkok’s riverside can be found. TD: How has Marriott evolved during your career and how does it stay competitive? MS: Marriott International reached a significant milestone when it announced a merger with Starwood and became the world’s largest lodging company — with more than 6,500 properties across 127 countries and territories, reporting revenues of more than $22 billion in fiscal year 2017. I think that the Marriott loyalty programme is probably the strongest in the industry which is set to be even better with the upcoming unified loyalty programme, formed by Marriott Rewards, Starwood Preferred Guest and The Ritz-Carlton Rewards. It is already the most awarded programme in the industry. By expanding its portfolio each year Marriott is able ensure it maintains a clear competitive advantage and, through its dynamic sales and marketing platform, it is able maximise the ROI for the hotel owners. Bangkok’s stock is on the rise bringing in changes to the social and physical infrastructure of the city. Arriving at the Sheraton 18 months ago, what changes have you seen? Bangkok Riverside has been developing for the past few years with the core concept of becoming the Bangkok’s Creative District. I’m convinced that the area will continue to evolve with the number of galleries, restaurants and other activities that arrived in the vicinity in the past few months. For example, Warehouse 30 – a community of creative businesses, open markets and rental studios, and TCDC – Thailand Creative & Design Centre are the biggest arrivals to the area, which are within walking distance from the hotel. Across the river, guests will find Jam Factory and Lhong 1919. The Jam Factory is a café, a homeware store, a gallery, a restaurant, a bookshop, and an office, all in one on the river. On every final Saturday and Sunday of the month, the Knack Market will be running with lots of ‘knick-knacks’ displayed over tables, booths and even the floor. Look out for vintage fashion, homemade accessories, decorations, antiques, artwork and retro gadgets. Lhong 1919 is a riverfront mixed use project of co-working space, eateries, and art and design shops. With the increasing importance experiential travel, what has the Royal Orchid Sheraton Hotel & Towers done to stay on trend? Our location is convenient and guests will find it easy to make their way into the city centre or travel to Bangkok’s famous tourist attractions, using either the nearby sky train, metro or bus connections – plus three piers of the ferry terminal located next door. We are also well within walking distance of China Town and the oldest road in Bangkok, Charoenkrung Road. There is so much history around the area; for example, the Sol Heng Tai Mansion – a hidden gem of Talad Noi, which showcases Chinese architecture and ornamentations dating back more than 200 years. To makes things easier for guests staying at Royal Orchid Sheraton our concierge service will show the best ways to get to their chosen location in and out of the city. The concierge services are also experts on the happenings of the local neighbourhood – this is especially true when it comes to our one-hour gem programme. What exactly are one-hour gems? One-hour gems are part of a programme where we recommend our guests to explore the city’s inspiring local ‘gems’, found within an hour of the hotel. We’ve curated an intimate excursion into the sights, sounds and tastes of the destination, from local-led adventures to immersive cultural bustle, so you can make the most of your trip. We’ve formed a partnership with bangkokriver.com which is a collaboration of Bangkok river business partners located along the Chao Phraya River to promote surroundings and attractions. We also work closely with overseas and local influencers to create content which will bring the Creative District and our other one-hour gems to the public eye. What are your favourite one-hour gems? My favourite place is Klongsan Plaza. Guests can easily take a five-minute boat ride from Si Phraya Pier located next to the hotel over to the market. Here they will find all types of bargains, from rhinestone bags to shiny patent leather shoes, all sold at decent prices and flanked by massage parlours and nail salons. It’s a great spot for trying out local food too, with street vendors dishing up bowls of authentic Thai treats in front of several of shops and stalls. To learn more about the one-hour gems and explore the Bangkok Creative District visit Royal Orchid Sheraton Hotel & Towers to receive a promotional booking rate.